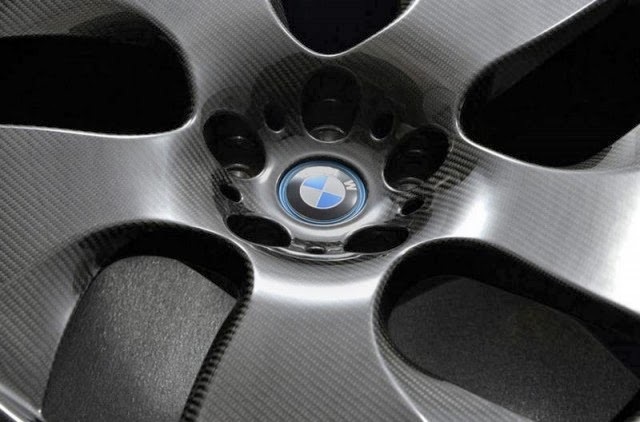 BMW say they could offer entire wheels in carbon fiber reinforced plastic. The wheels are close to production and may be available in one or two years. According to BMW the full-CFRP wheel is 35-percent lighter than a forged alloy wheel, and the one using a CFRP rim and alloy spokes will be 25-percent lighter. Innovative use of materials in the BMW i3 and BMW i8. Systematic lightweight design is particularly important on electrically powered vehicles, given that vehicle weight is one of two main constraints on vehicle range, along with battery capacity. For EVs, too, reduced weight means reduced energy consumption and improved driving dynamics. In order to offset the weight penalty of the electric components, the BMW Group came up with a rigorous lightweight design strategy for the BMW i brand in the form of the LifeDrive concept, an innovative vehicle architecture which for the first time combines an aluminium chassis and a CFRP passenger cell. CFRP: high-tech material of the future. Carbon-fibre-reinforced plastic (CFRP) boasts a particularly favourable strength-to-weight ratio and is therefore an ideal material for use in the vehicle body. For the same functionality, CFRP is around 30 per cent lighter than aluminium and 50 per cent lighter than steel. Used in the right places, this material therefore reduces weight, optimises the vehicle’s centre of gravity and improves body strength. This material is currently being used not only in the new BMW i3 and BMW i8 models: the sporty BMW M3/M4 and BMW M6 models have likewise been utilising the benefits of this high-tech material for some time. Components such as their roof and bumper supports are made of CFRP. The BMW Group is currently working on further potential applications, including the use of this material in rotating-mass components. Examples include hybrid aluminium/CFRP wheel rims, while CFRP’s high rigidity and low weight allow the CFRP propeller shaft on the BMW M3/M4 to be produced as a single-piece component, without a centre bearing. This results in 40 per cent weight savings over the previous model and reduced rotating masses, leading to further improved response. In future, other BMW and MINI models will also benefit from this lightweight material in various ways. For example, production offcuts can be reprocessed into “secondary” (recycled-content) CFRP, which can be used to reduce the weight of components such as seat frames, instrument panel frames and spare wheels by up to 30 per cent, with simultaneous improvements in terms of cost-efficient, environmentally friendly manufacturing. Technology leader in mass production of CFRP components. After more than ten years of intensive research, resulting in improvements to processes, materials, production machinery and tools, the BMW Group has today become the first and only car manufacturer in the world with the necessary know-how to use CFRP in mass production. The processing technology used is unique and cycle times for even the more complex CFRP components are unusually short. The same is true of the specially developed bonding process used in the fully automated assembly of body parts. As well as setting standards in the production of CFRP finished components, the BMW Group also attaches utmost importance to the use of environmentally friendly, resource-efficient and largely CO2-free processes in the manufacture and processing of the raw materials themselves. From fibre production right through to recycling of fibres and composites, the company is involved in all the various process steps in a state-of-the-art CFRP production chain that begins in Moses Lake in the USA and moves through Wackersdorf and Landshut to final assembly in Leipzig.